The ninth best movie of all time  Preston Sturges' The Lady Eve, bless it  has " 'steamy innuendo' and 'wacky pratfalls.' " Ingmar Bergman's somber medieval miracle play The Seventh Seal is "an utterly foreign flick and staple of 'college days.' " You may recall Michelangelo Antonioni's Blowup as a meditation on illusion and decadence; or, to put it in Zagatese: " 'Forget Austin Powers,' baby, 'this is the real swinging London.' "
Zagat, the book and online franchise that collates the dining preferences of contributors in 40 cities worldwide, has lately set its unpaid freelancers to work judging hotels, golf courses, dating rituals  and movies. Applying the same maddeningly copious use of quote bites, Zagat has just published The World's Best Movies ... to Make Sure You Have Seen Before Your Popcorn Runs Out. A thousand films are rated "based on the candid appraisals of 20,773 avid moviegoers like yourself." They're here to certify your prejudices, whoever you are. And if you're like the Zagatians, you love the oldies, usually with a social message, a sneering villain and a lot of emotional uplift. Like most movie critics, I believe the truism that everybody has two jobs: his own and mine. No expertise is necessary for the vox pop, just years of sitting in the dark, with or without popcorn. As one of the professionals who's been putting his movie thoughts into print for a while and who, back in the Dark Ages, went to a couple of film schools for an official education in the trade, I'm expected to moan here about the democratization of movie reviewing. I won't. I think it's swell that the online explosion has encouraged more voices, including many cogent ones, to join the chorus of informed opinionators. And listmaking has been an illuminating way to codify social norms ever since the Ten Commandments. Like any other list, the favorite films in the new guide tell us more about the Zagat raters than they do about movies. See how the highest-rated Zagattractions are mostly serioso? Start with the inevitable Godfather tandem, add a pair of dramas about bad Nazis, then teach lessons about the mistreatment of Arabs and American blacks by their Anglo overlords. It's not until the 7-10 slots that we find true escapist entertainment  in the form of a science-fiction epic, two beloved musicals and a spot-on romantic comedy. Note that seven of the Zagat 20 are set during, just before or just after World Wars  I (Lawrence of Arabia, The African Queen), II (Casablanca, Schindler's List, The Pianist, The Third Man) and III (Dr. Strangelove)  and that's not including the postWW II scenes in the first Godfather or the galactic confrontation at the heart of Star Wars. There's not a sucky film in this 20, but at the top it's kind of like school. For the cine-Zagaters, "best" must mean old. Only four of the first score of films  Schindler, Shawshank, The Pianist and Finding Nemo  were made in the past 30 years. Of that quartet, all but the Pixar picture (the only animated feature on the list) are essentially prison-break movies. When the favorites are broken down by decade, the best film of the '90s is the "painful" "tour-de-force" Schindler's List (the obvious choice, Pulp Fiction, didn't make the top 100), while The Pianist  "agonizing," "haunting" and "harrowing"  is deemed the best of the oh-ohs. (If you're wondering, The Lord of the Rings: The Return of the King came in 21st.) Nothing wrong with those two films about Jews surviving Hitler, but it's a stretch to call them the best of their decades. Hey, folks, the war's been over for 65 years. Can we move on in choice of stories we find important? The Zagateers are a bit less anachronistic in their choices of all-time favorite actors (Cary Grant, the leader, is followed by George Clooney and Johnny Depp) and actresses (Meryl Streep, then Sandra Bullock and Katharine Hepburn). But the respondents' tastes are defiantly midcentury and midculture. The top-rated western is High Noon, not The Searchers. Stately tableaux like A Man for All Seasons and The Lion in Winter beat out the top-rated horror film (Psycho) and "comedy" (Some Like It Hot; the editors consider The Lady Eve a "romance," even with all those "wacky pratfalls"). As devoted as the Zagattendees are to the sort of weighty drama that Andrew Sarris used to characterize as Strained Seriousness, you'd expect some old French or Japanese pictures in the top 20. Alas, no. This survey excludes foreign-language films on the main list and shunts them into a sidebar list. For the record, then, Akira Kurosawa's Seven Samurai and Rashomon would have been in the overall top eight, closely followed by The Lives of Others, Children of Paradise, Jean Cocteau's Beauty and the Beast, Kurosawa's Yojimbo and three more war films, Grand Illusion, The Battle of Algiers and Das Boot. Again, all exemplary films  but predictable in the extreme, for even Zagat's foreign-film connoisseurs prefer storytellers and mood weavers over the acknowledged old masters of cinematic innovation. On the separate foreign-films list, there's no Bergman in the top 10, no François Truffaut in the top 20 , no Pedro Almodovar in the top 30 and no Jean-Luc Godard or Werner Herzog in the top 50. Zagat's dining guides rate restaurants on a zero-to-30 scale in four categories: food, decor, service and cost. Here, the criteria are overall quality, acting, story and "production values," which can mean anything from sumptuous art direction to elegant visual style. The rating is clear enough with a movie like Avatar, which pulls a 20 for story but a 29 for production values. But how does The Lady Eve  whose celestial ranking pleases me to no end, and which everyone reading this should rent or buy this minute  merit the same high production-values score (26) as Orson Welles' The Lady from Shanghai, a movie whose delicious, delirious camera work is its very reason for being? I suspect that most of the 20,773 survey filler-outers are Zagnostic when it comes to visual style and that they'd rather feel a movie than look closely at it. Right off, you can make demographic profiles of the Zagattinis and the IMD-briefers: the former are older, more female-oriented and fond of dining out à la française, the latter filled with young males who eat at Arby's. 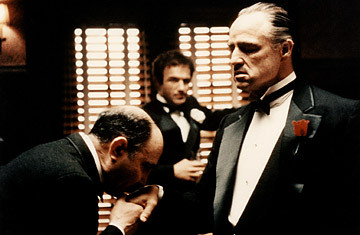 Though the Godfather films are near the top, the IMDb top 20 has only six other movies made before 1980. The preferred auteurs are Francis Coppola, George Lucas and  a latecomer  Christopher Nolan (Inception and The Dark Knight), whose Memento also made the top 30. Nolan's on the list three times before Citizen Kane shows up, in slot 37. The IMDb crowd goes for fratricidal melodramas like Pulp Fiction, Goodfellas and Fight Club over the Zagat tearjerkers, with the exception of two other all-guy movies, 12 Angry Men (38th on the Zagat list) and The Shawshank Redemption  a movie that has been at or near the top since the mid-'90s. IMDb does acknowledge foreign films, with Seven Samurai, Fernando Mereilles' City of God and (granted, a stretch) Sergio Leone's The Good, the Bad and the Ugly in prominent positions. Zagat not only kicks foreign films into an art-house ghetto, it ignores some of the IMDb finalists. Among the 1,000 films in the new guide, the Brazilian City of God is not to be found. Between these two lists  and the immeasurably more informed All-TIME 100 Movies that Richard Schickel and I came up with in 2005  the interested cinephile could stumble toward a consensus. But no selection of immortal films is writ on stone tablets; it is as personal as a favorite restaurant, song or person. (One man's choices: Maschou in Cannes, the Beach Boys' "God Only Knows" and Mary Corliss.) And as Alfred Hitchcock, whose masterpieces Psycho and Vertigo rank lower on both the Zagat and IMDb lists than the merely near great Rear Window, once said, "It's only a movie, Ingrid." My advice to the avid moviegoers at Zagat and IMDb: check out the other side's top-20 list and see the ones you've missed. You might learn something. See the top 10 movie gangsters. See the 100 greatest movie insults.